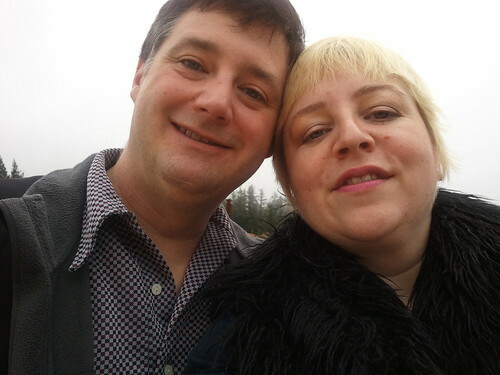 The drive to Poetic Cellars, another winery on the great Summit To Sea Wine Trail, is along twisty roads through beautiful (and during our visit, rain-laden) redwoods. Your GPS won’t help you out here; you’ve reached a Land Without Mobile Reception. Fortunately, the staff at Poetic have signs posted along the way to help you find their winery. 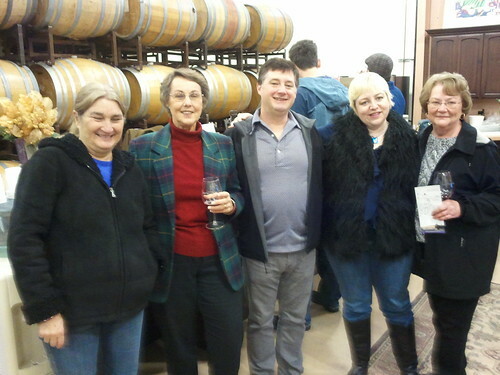 When we arrived at Poetic Cellars, we met some friendly fellow wine tasters who we’d previously seen at Burrell School. Unlike us, they’ve done a thorough investigation of most of the Santa Cruz Mountains wineries. They encouraged us to make our way over to Los Gatos and Saratoga. So much good wine, so little time! 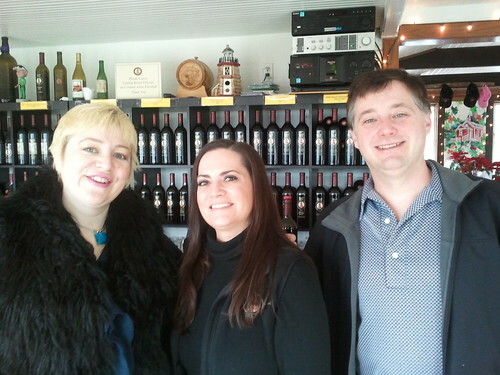 We didn’t know until we visited Poetic Cellars’ website today that our wine was poured by winemaker Katy Lovell herself! Her son also poured some of our wine. 2008 Livermore Viognier: It smells like nectar and tastes like fruit blossoms and perfumes. (Okay, I admit it — I’m a sucker for Viognier.) Mike noted a grapefruit hit at the end. 2006 Livermore Mouvedre: Dark chocolate and oak in the nose. Very astringent finish. Mike liked this a lot, noting a smoky flavor that was quite appealing. 2007 Merlot: Smells delightfully of chocolate and honey. Tastes like toffee and plum skins. Rich and absolutely delicious. 2006 Stanza Vineyard Syrah: Full of cherries. It had a tasty ash overtone, like Humboldt Fog cheese. It made me wonder if the vineyard had been in an area near one of the California wildfires. Chant Royale: Gosh, I wish I hadn’t hit palate fatigue right as she pulled out this port-style wine! This sweet, cherry-filled wine would be perfect under most circumstances, but my dead tongue was overwhelmed by alcohol. From left to right: winemaker Katy Lovell, one of our wine tasting buddies, Mike Rainey, Nikki Gustas, and another wine tasting pal. After the tasting, Mike stopped to admire the view from the parking lot. On the drive home, Mike noted that one of the most enjoyable aspects of the wine tasting experience is that you meet great people along the way. We were lucky enough to strike up conversations with two separate great groups of people, and also got wonderful information on wineries around the country to visit from the tasting room staffs that we met. On our ride home, we saw a rainbow above Highway One. Mike would call it a weather pattern. I like to think of it as a good omen for our Appellation Trail project. We decided to hit the ground running — or, more to the point, drinking — on January 2 with a trip to a nearby wine destination we’d yet to explore, the Santa Cruz Mountains. 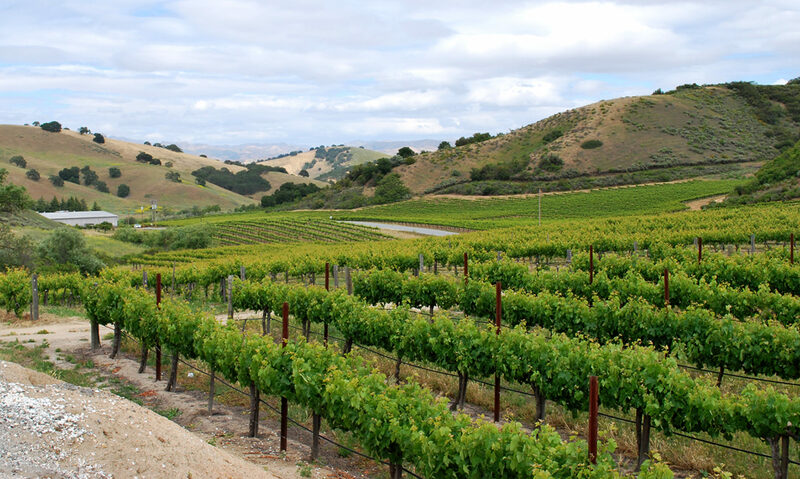 These wineries are an easy drive both from our hometown, Monterey, and from Silicon Valley. Plus, it’s an area that’s easy on the eyes, making it a perfect Sunday outing. As soon as we made that decision, I hit the web for some ideas as to where to go. My first stop was the Santa Cruz Mountain Winegrowers Association website. I immediately felt at home there due to its striking resemblance to the Monterey County Vintners and Growers Association website, a site where I spend a not-insignificant amount of time. I browsed their listings and immediately latched onto Burrell School Vineyards and Winery. A winery? Located in a historic schoolhouse? Which has the slogan “I promise to sip my wine. I promise to sip my wine” written in chalk across their website? My little former-15-year-old truant heart (ssssh! Don’t tell Mom!) filled with glee. Another big plus was the big “Location” button on the website. Do you have any idea how many wineries list every bit of data about their tasting room on their “Tasting Room” page, except its location? It’s as if the location of many wineries is a closely guarded secret. Tip #1 to Winemakers: If you want people to visit, make sure you list your address on the “Tasting Room” or “Location” page! We took a back road to Burrell School, driving up (and up, and up) Soquel-San Jose Road to Summit Road. The drive, through misty redwoods, was breathtaking. 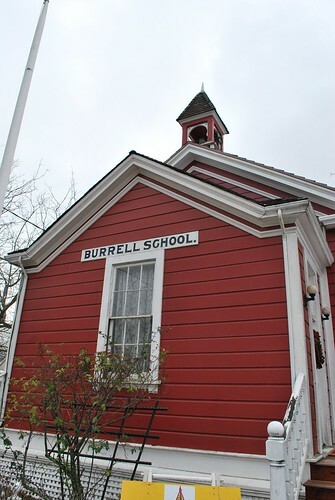 The turn onto Burrell School’s driveway, however, was a sphincter-clenching hairpin turn. Note to others visiting: come up Summit from Hwy. 17 – you’ll be happier. The front of Burrell School Vineyards & Winery. Tasting is done in an adjacent building that once was a carriage house. Burrell School gets an A+ for follow-through on their theme. 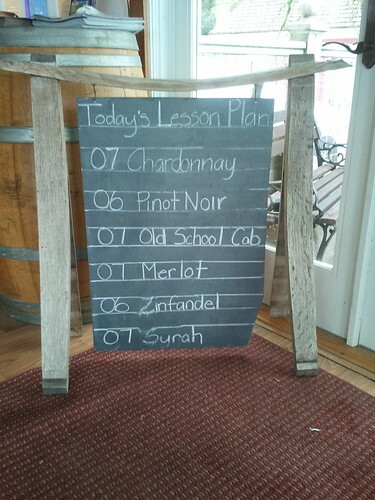 Tasting information is written on chalkboards around the tasting room. Small wood-framed slates (about the size of an iPad) sit next to each bottle of wine on the roster, each with chalk notes about the vintage. Even the wine names follow the theme, with sobriquets such as “Principal’s Choice” Pinot Noir and “Detention Red” Zinfandel (a name that absolutely appeals to a rebellious zin lover such as myself). 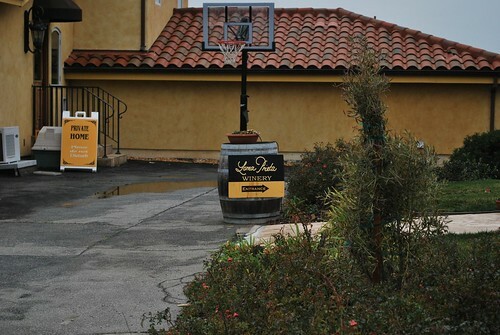 The whimsical school theme touches every aspect of this winery. If the theme was playful, the tasting staff was all business. They’re serious about wine, and it shows. The couple who staffed the wine tasting bar (sadly, I do not remember either of their names, but I do remember she’s born on February 3 and he’s just a couple of days away from that) were very focused. He was kind enough to give me tips on several wine apps for my brand-new Android phone. If Burrell School’s wines were being portrayed by an actor, they’d be portrayed by the legendary Brian Blessed. As you drank the wines, you’d hear him say, “My friend! I have been FERMENTED in OAK! Feel my OAKINESS EXPLODE upon your TONGUE!” If you love oak, this is your place. 2007 “Teacher’s Pet” Chardonnay: I found this wine to be oaky, with some butter up front, but in the end more astringent than I wanted. For me, this wine would be perfect with a thicker layer of fruit in the middle. Mike found it more lively than many other chardonnays though, and liked it for this reason. 2006 “Principal’s Choice” Estate Pinot Noir: Yummy and full of cherries, again with a strong oak finish. 2006 “Dean’s List” Cabernet Sauvignon: Smelled deliciously of chocolate and raw wood. The oak was up front on tasting, the fruit a very mild-mannered presence underneath. 2007 “Honor Roll” Estate Reserve Merlot: There’s a smell that certain wines get that make me want to wear them as perfume for a sultry night out. This is one of those wines. It was loaded with berries and had a hard oak finish, almost as if the wine were slamming the door on my palate. 2006 “Detention Red” Zinfandel: A name after a girl’s heart. Sweet cherries at the front, hard oak at the back. This wine was the lone Amador County wine in a tasting full of Santa Cruz Mountain appellation wines. 2007 “Spring Break” Syrah: Gorgeous smell; the taste was like having Brian Blessed do a little “Oak! Oak! Oak!” dance on my tongue. Late harvest “Chaperone” Chardonnay: There’s a particular note in the smell of skunk that I actually like. It’s pretty buried and I’m not sure anyone out there can smell it but me. But this wine had a hint of that, and I consider that a positive. Syrupy but not overwhelming, like Semillon without the saffron finish. Late harvest “Probation” Zinfandel: The scent was full of tobacco and leather, absolutely delectable. The flavor was sweet, tart and complex, with a hint of leather. If Burrell School’s other wines are Brian Blessed, this wine is Brian Blessed as a biker in Easy Rider. (I know, I’m reaching…but I’m committed to this metaphor, darn it!) Mike thought that this wine would be one to reach for on a cold, blustery night while wrapped in a blanket listening to the weather. “Deportment” Zinfandel port: This wine seduced me with its name, and the flavor finished the job. If you made a Zinfandel Jolly Rancher, it would take like this. I like both Zinfandel and Jolly Ranchers, so I’m a big-time fan. Burrell School Winery is just one of the wines on the Summit to Sea Wine Trail. The trail is worth seeing both for the wines and the views!